The ever popular comedian William Caulfield is back on tour again with yet another brand new show. This year he leaves aside the comedy characters and does what he does best – great stand-up comedy about our everyday lives here in Northern Ireland. A master story teller with great skill at picking out the extraordinary humour from the ordinary this will be a night of laughter that you cannot afford to miss. 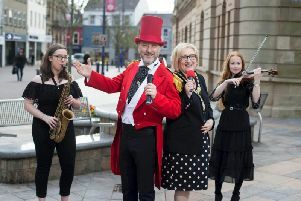 Well known from his comedy shows both on BBC NI and Radio Ulster this is William’s first return visit to the Waterside Theatre in over eight years. It’s a balanced family – friendly show – no filth, no foul language - just funny. ‘William Caulfield Live’ will be at The Waterside Theatre on Friday 20th March at 8.00pm. Tickets £16.00 including development donation.